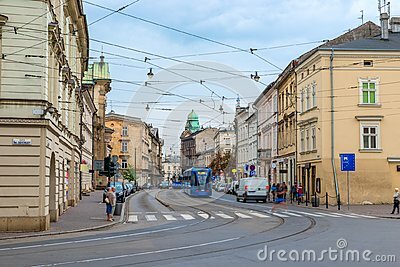 stock image of Trams in old part of Krakow at summer. stock image of KRAKOW, POLAND - JANUARY 01, 2015: Tram SGP/Lohner E1 in the historic part of Krakow in night. stock image of Street of the city of Krakow. The old Town. Public transport on the streets. Trams and buses. Polesha. City center.